This guide is meant to provide all of the necessary items for being the Systems Administrator for Zoom. Most of Zoom is easy administrate through the Web Management Console (Webmin) interface. This allows System Administrators and Project Managers to quickly make changes to the server using only their web browsers. Periodically, Evolphin will release updates for Zoom that will include new features and fixes. Upgrading requires the upgrade of the Zoom Server, Preview Server, and Desktop clients. Therefore, it is highly suggested for the upgrade of Zoom to be done when it is convenient to upgrade each of these systems. The upgrade process is quite straight-forward using the articles listed below. Zoom has a variety of different licenses available. When you run out of seats for Zoom, you might need to purchase additional seats. The links below describe how to update links once you have purchased new licenses. If you need additional licenses, contact Evolphin Sales. Zoom Server integrates with the operating system services systems. Below describes how to turn the operating system services for the Zoom Server and Zoom Preview Server on and off. The Web Management Console is the tool for configuring the projects, users, roles, and any of the system configurations. It is recommended to use a modern browser such as Google Chrome, Firefox, or Safari when using the Web Management Console. In your preferred web browser, navigate to http://[YourZoomServer]:8443, replacing [YourZoomServer] with the address to your Zoom Server. Log in using your user credentials with ADMINISTER privileges. If login is successful, you should now see the sidebar on the left-hand side display with different options. As you have your Zoom Server running, there are a variety of different configurations you can setup in Zoom. The following are some of the common configurations that are useful to setup for users. 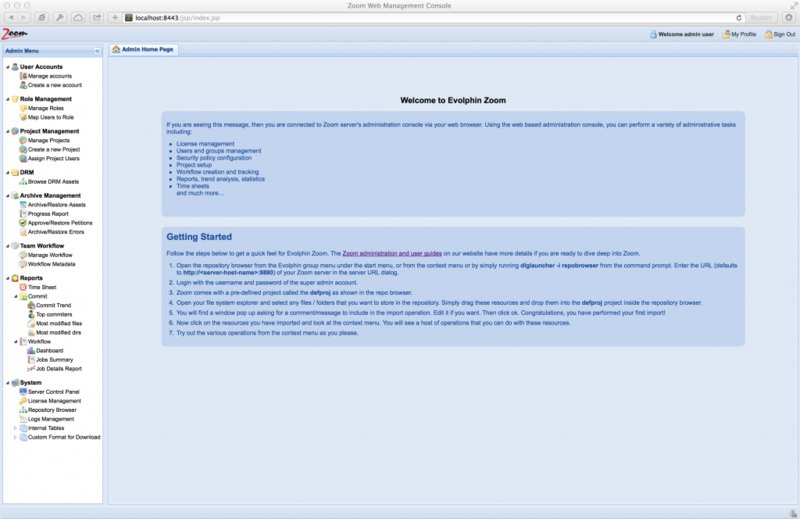 Guide for managing users within Zoom Administration Console. Step-by-step instructions to configuring custom metadata in Zoom. When trying to diagnose issues, there are a variety of different logs that can help you diagnose issues on both the Zoom Server and Zoom Client. Below are articles helping you find all of the appropriate logs that you need. When you get in trouble and there are problems, you need to know where to look to diagnose the issues. Before opening a ticket with Evolphin Support, we ask that you try to first to see if there already is an answer out there. Below are some of the common links that can help you diagnose issues.